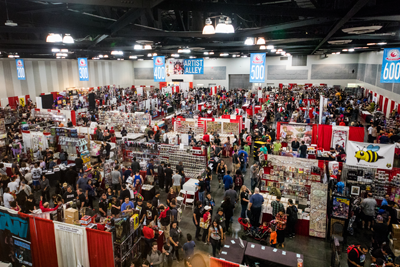 Comic Con Revolution, The Inland Empire's first full scale comic con, opened big attracting 5449 unique attendees. This number does not include exhibitors or staff. Organizers, Atomic Crush Events (ACE), have announced that the event will return to the Ontario Convention Center in Ontario California for two days in 2018 May 19 & 20. "We wanted to create something special for Ontario and the entire Inland Empire to call their own," said ACE Co-Founder Gabe Fieramosco. "We cant thank them, as well as our exhibitors and guests, enough for the support they showed us. Long live the 909! Cant wait to see you all again next year." "[Comic Con Revolution] reminded me of San Diego Comic Con before the movie studios took over. It was just about the comics, said attendee Ronald Scott of Claremont, California. Comic Con Revolution will grow in 2018 taking over both exhibit halls as well as the Mayoral Ballroom. The event will add additional features including a Professional Creator's Summit on Friday, May 18th, play host to the Girl Scouts of Greater Los Angeles as they complete their Comic Book Artist badge while growing the exhibitor and guest lists. "We are already hard at work laying the foundation for next year's Comic Con Revolution," said ACE Co-Founder Mike Scigliano. He added, "And we'll spend the next 12 months preparing an even bigger and better experience." Exhibit sales are already underway for Comic Con Revolution 2018 with ticket sales opening in the fall of 2017.